It is official! My husband matched into Residency and we are moving in just a few weeks! We are headed to Indiana for a year then on to Texas for 3 years! We are so excited to begin this next adventure! That being said, things have been absolutely crazy these last few days! I am a huge fan of quick and easy meals, and this is one of them! This is one that your whole family will love! Your picky eaters will even enjoy it! 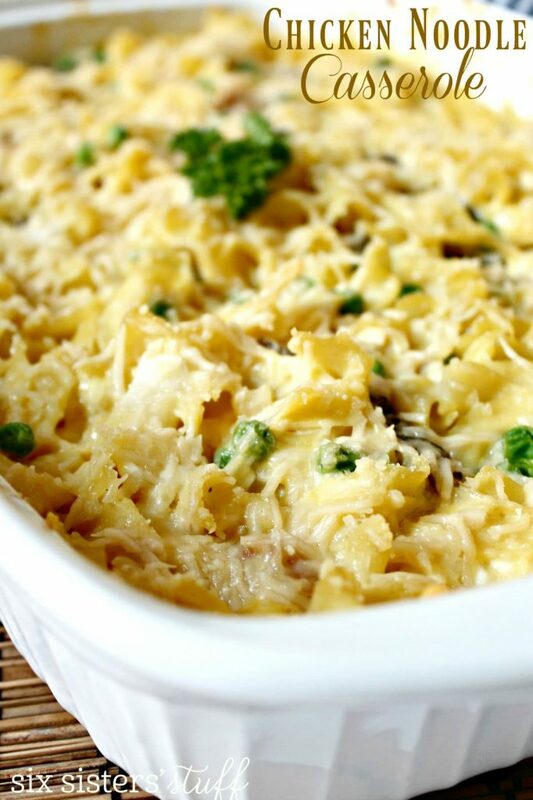 Place your noodles and chicken in a 9x13 inch baking dish that has been sprayed with non-stick cooking spray. Combine soup, sour cream, and veggies in a small bowl. Pour mixture over chicken and noodles. Add garlic salt, salt and pepper and mix well in your pan. Cover and bake for 30 minutes (or freeze for baking at another time). 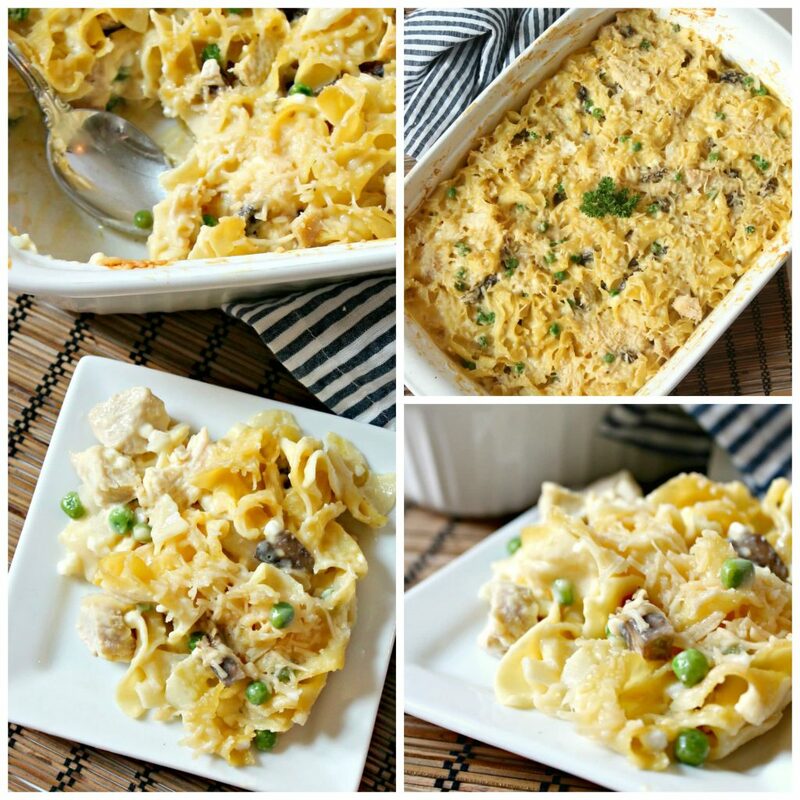 Check out some of these other casseroles! We are so excited to announce the release of our NEW cookbook! We asked our readers what they wanted in a cookbook and received an overwhelming response about menu planning. Well, we’ve got you covered! We have put together 52 menu plans (and over 150 recipes) to make meal time easy and delicious! I saw your new book in the bookstore yesterday and bought it. I love it! 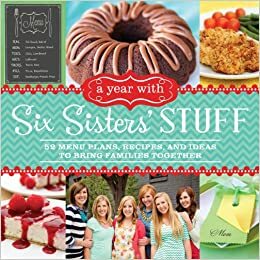 My whole week's meals are planned using recipes from your book! If I cover and freeze for another time what would be the baking instructions? Still 350 for 30 minutes? I make one very similar to this - only I eliminate the mushrooms (which I don't like) but add shredded cheese. I then top it with crushed potato chips. LOVE IT!!!!!!!!!!!!!!!!!!!! the dish was good but it was dry. I followed it to the letter but left out the peas. Do you have any suggestions? I added a bag of frozen peas and carrots and 1\4 can of milk using the soup can. I just mixed everything in the bowl before I put it in the dish and then covered it with foil and mine came out very creamy and delicious. Hope this helps! ? i too found it to be very dry? No milk or anything else needed ? I liked it but thought it was a little dry too, thinking next time I might use less noodles & chicken with the same amount of cream of chicken/sour cream sauce since we had a lot left over. First why would you put chicken and noodles in the pan and mix all other ingredients poor mix over and then mix well in the dish second how do you salt and pepper to taste before you cook it to taste it third garlic salt was not listed in ingredients.over all it tasted great although it was dry was I supposed to add milk to the soup? Those that had dry results....did you cover the casserole? Just tried it tonite; jazzed it up a bit (some chopped up carrots & some green peppers I had). To combat the dryness that was mentioned I simply added some (roughly 3/4 C ) of the pasta water. Topped it with some buttered panko bread crumbs, then baked it in a covered casserole dish for 30 minutes, then uncovered for another 10 minutes or so. Seemed to have plenty of moisture, and tasted quite good to boot.